David Beckham's England career took an unexpected turn with his recall to the squad in May 2007 when it looked unlikely that he would play again after he retired as captain at the end of the 2006 World Cup. He has had a turbulent England career, from the hero the whole country wanted to see playing, to the universal hate figure, then working his way up in the country’s estimation again, only to fall once more on the lacklustre performances of the England team in the new millennium. Perhaps his return will write another successful chapter to the story? David Beckham had quietly progressed from Manchester United’s youth team to become a first team regular when he suddenly announced himself to the world at large by lobbing Neil Sullivan, the Wimbledon goalkeeper, from the halfway line. This goal, voted ‘Premier League Goal of the Decade’, was remembered not only for its skill and audacity but also for the fit of apoplexy that afflicted the startled TV commentator. A couple of months later Glenn Hoddle, on his debut as the England manager, picked Beckham to make his playing debut against Moldova in a qualifier for the 1998 World Cup in France, subsequently keeping him in the team for all the remaining qualifiers. But at the World Cup itself, Hoddle took criticism for leaving Beckham and the young Michael Owen out of the early matches. Hoddle said that in Beckham’s case it was because he wasn’t focussed on playing, but with the tabloids baying back in England, Beckham was played in the last group stage match against Columbia and repaid Hoddle by scoring the only goal of the game with a beautiful free kick from distance, curling around the wall, which was voted one of the England’s 50 Greatest Goals in a 2005 poll of fans by Sky Television. Then the sky fell in the next match against Argentina, which England lost on penalties. After Beckham had been fouled and felled by the Argentinean hatchet man Simeone, he petulantly kicked out at his opponent as he passed and was sent off. Beckham took criticism for this action for the best part of the following two years, but, although it was a stupid thing to do, it was more Beckham’s inexperience that let him down as the over the top reaction and badgering of the ref by the Argentineans caused the sending off, something they admitted afterward. The stick that was handed out to Beckham was led by the same tabloids who had been pillorying Hoddle for not playing him, and it didn’t improve until after England’s exit from the European Championship of 2000, where England failed to survive the group stages. After that the tabloids decided to lay off Beckham and when then manager Kevin Keegan threw in the towel after Germany’s win in the last match at Wembley, caretaker manager Peter Taylor gave Beckham the captain’s armband. When Sven-goran Eriksson was appointed coach he consolidated this appointment, and Beckham began to rise in the country’s estimation after a series of hard working displays, as the team tried to recover the perilous 2002 World Cup qualifying situation, including the 5-1 revenge demolition of Germany away from home. The qualifying rounds came to a head at the final match against a Greek side who were then very unfancied, but who would later develop to lift the European Championship crown in 2004. With England needing a draw, Greece went into the lead, then Sheringham equalised only for Greece to score again a couple of minutes later. At the end of the match, just into injury time, Beckham buried a dipping curled free-kick from 25 yards to seal a personal triumph after he had roused and lead the whole team. 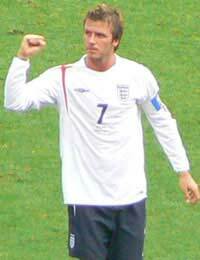 That Beckham’s public reputation had been rehabilitated was confirmed when he won the BBC Sports Personality of the Year award and came second as FIFA World Player of the Year, to Luis Figo. At the World Cup itself, Beckham was coming back from a broken metatarsal that he’d incurred in a Champions League match and did not appear to be playing as well as before the injury, but he did to score an iconic penalty to Argentina 1-0, which is no bad thing. The young team went on to beat Denmark 3-0 in the second round and meet Brazil in the quarter-finals, where they lost 2-1. The next major tournament was Euro 2004, by which time Beckham was at Real Madrid but had again missed a lot of football because of injury problems. The England team did not meet expectations and Beckham had a bad time, missing a penalty against his old team-mate Fabian Barthez in the group match against France and missing again in the penalty shoot-out at the end of the quarter-final against Portugal. Beckham’s public stock began to fall again as fans, most of whom were unable to watch him play club football any longer, felt he was being selected because he was Sven's captain rather than because of his performances. The quarter-final defeat on penalties was to be repeated at the World Cup in 2006, although Beckham was off the pitch, injured earlier in the game, so didn’t have to take one himself. The whole tournament was a big disappointment for England, who did not perform as well as they and everyone else felt they could, and after the Portugal match Beckham announced that he would resign the captaincy. Beckham had created many of the goals that England scored in the tournament. Although England manager Steve McClaren said that the door was still open for him to be selected, he did not in fact select him again for nearly a year. Beckham's dramatic recall, when he made England's goal in a 1-1 friendly draw with Brazil to mark the opening of the new Wembley Stadium, did not change the fact that Beckham's move from Real Madrid to the LA Galaxy meant he will be playing a lower standard of football. Loan moves to AC Milan in the US season breaks have so far been enough for new England coach Fabio Capello, who Beckham played under at Madrid, to continue to select him although he often finds himself playing cameo roles, coming on from the bench. A review of Beckham's England career so far has to conclude 'could have done better'. He isn't the fastest player and rarely takes on and beats people. But his crosses, free-kicks and accurate passing make him a valuable asset and he added hard work and commitment to these as his career developed. But his football suffered, as with the whole team, from managerial changes and press pressure during his years with England. Despite this during a roller coaster England career Beckham has amassed over 100 caps and is chasing Peter Shilton's record of 125. He has only scored 17 goals but many of them have been critical, and he is the only English player to have scored in three separate World Cup tournaments. Will he make it four?